Here is the definitive history of the Watergate scandal—based on the most recently released tapes, in-depth interviews with many of the participants, and hundreds of official and unofficial documents, including notes Haldeman omitted from his own published diaries. Emery's comprehensive coverage and penetrating insights clear up many uncertainties that may still remain about the scandal and the extent of Nixon's involvement. Authoritative and compelling, Watergate is essential reading for anyone who wants to understand fully this traumatizing episode in America's history that challenged the integrity of its political system. 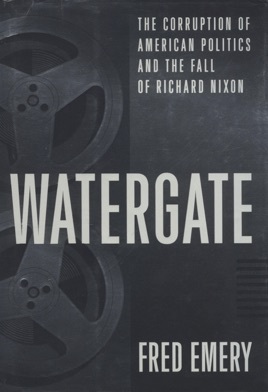 Anyone who needs to be reminded that Watergate was more than a ``third-rate burglary'' should read Emery's retelling of the scandal that drove Nixon from office. Drawing on the memoirs of many of the Watergate figures as well as an examination of the most recently released Nixon tapes, Emery, former Washington bureau chief of the London Times , relates an engrossing story of how the Watergate break-in came to pass, and how the coverup spread like wildfire throughout Nixon's re-election committee and the White House. Describing one criminal act after another, beginning with the break-in of Daniel Ellsberg's psychiatrist's office, Emery makes it clear that, in the words of special prosecutor Leon Jaworski, the Oval Office had been transformed by Nixon ``into a mean den where perjury and low schemes became a way of life.'' Given the illegal activities Nixon condoned and/or conducted, as related by Emery, most readers will find it hard to feel much sympathy for him even as the author relates the agony of the late president and his family during his final days in the White House as resignation became inevitable. This devastating account of presidential disgrace will give pause especially to those feeling bereaved by Nixon's death.